A very warm welcome awaits you at Reception! 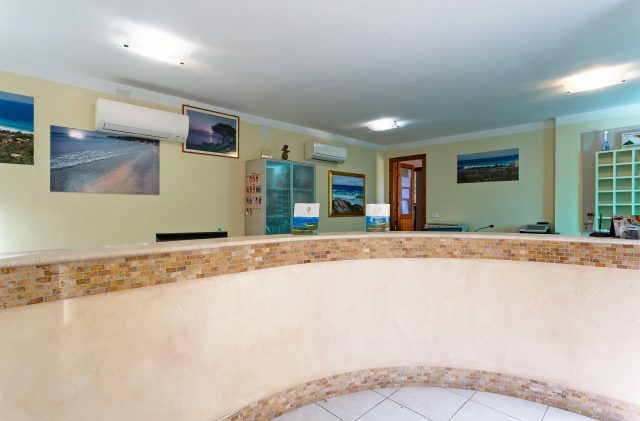 The staff at the Reception desk at Camping Cala Ginepro are at your disposal for the entire duration of your stay. We will be delighted to welcome you on your arrival and to help you complete all of the necessary paperwork before issuing the passes you will require for your holiday. At Reception, you can also hire the multi-purpose synthetic grass pitch/court and mountain bikes, or top-up the internal card that you can use for all payments on the campsite. We accept credit cards along with Maestro, Mastercard and Visa debit cards. In addition, we offer a safekeeping service for small valuables. The noticeboards outside Reception contain a wealth of information on trips, excursions and transport links with sea ports and airports. The staff are at your service to help make your time on the campsite a truly special holiday!